It started with a simple letter that Ryan Currens sent to President Barack Obama earlier this summer. The parish administrator at Assumption in Richfield encouraged the chief executive to read Pope Francis’ encyclical on the environment, “Laudato Si´,” which came out in June. His letter led to a call from the White House offering him the chance to be part of events surrounding the audience the president and the Pope Francis will have Sept. 23 in Washington, D.C.
Currens had no idea his written words would even be read by anyone at the White House, much less lead to an invitation to be in the presence of two of the world’s most influential leaders. He was driving to a McDonald’s for dinner with his wife, Meghan, and their three children when his cell phone rang. The “deal” was an offer to come to Washington to see the president and the pope. The communications person he talked to explained that his letter made an impact, and that they were looking for representatives from each state to attend. They were hoping at least some of the attendees would be military veterans, and Currens fit the bill, having served in the Army for three years from 1999 to 2002. They offered him three tickets, and he immediately asked his wife. They considered taking their youngest child, Johnny, but ultimately decided against it. That left one ticket to give away. 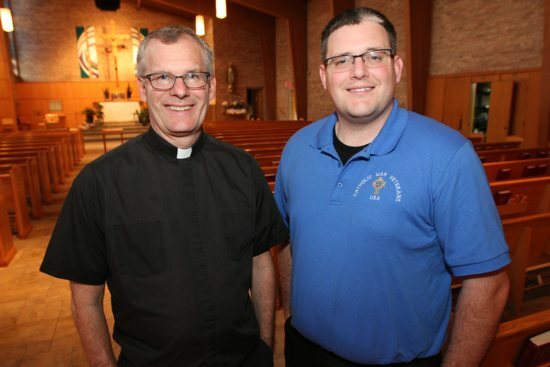 He approached the pastor of Assumption, Father Mike Kueber, and offered him the ticket. Father Kueber quickly and eagerly accepted. Neither of the men knows whether they will have the chance to greet the pope or the president. But, Currens knows what he would say to the president if he gets the chance.